He is a rock-musician from Saint-Petersburg. 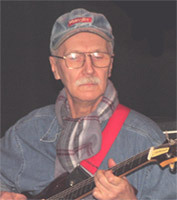 Since 1965 he has been a bass- guitarist than he is an acoustic and solo guitarist. He collaborated with Yuri Morozov for a long time. There were two alive concerts (“ Jazz at Night” and “ Session 77” ) the came into the golden fund of native rock. The first band with his participation was Yakob Pevzner, Michael Kudryavtscev, Andrew Shapito, Kulikov Kirill. In 1971 the band “ NU POGODI!’ appeared . It consisted from Berendukov Y(the guitar), Leonid Esselson (the flute), Anisimov Henadiy ( keyboards), Michail Kudriavtscev ( the bass), Pashkov Alexander (the vocal), Kucherov Igor (the drums). In 2007 he recorded the song “Frozen Time” by Morozov Yuri in Saint-Petersburg. He gave concerts with his band in the club “ Orlandina” on April, 13, 2006 and he gave the concerts in honor of Yuri Morozov on March 6, 2007.